Remote backup acts like tape or DVD RAM backup but instead of being attached to the users’ computer system, a remote backup sends encrypted files over the internet to a computer storage system safely off-site. By backing up data off site you are protected against any disaster at your own premises and data can be restored to any computer. Screentech IT Solutions have established a secure storage facility where individual accounts are maintained for each client. 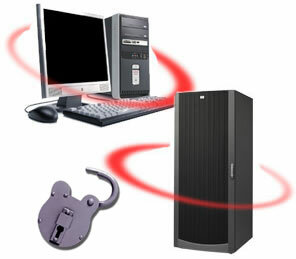 Each clients account is password protected and all files are encrypted so that only the client can retrieve their files. Backup is fully automated using a Windows Explorer interface and files are backed up each working day at specific times. The software identifies new files and those that have changed since the last backup, compresses and then encrypts them. These files are then transmitted via the internet to the Screentech storage facility where it is verified and stored securely.